The tagline to the Golden Bear Triathlon is ‘This Bear Bites’ and they are not kidding. I thought this race was way harder than Wildflower Short Course and I’ll show you why. Let’s compare and contrast. A swim is a swim. My Wildflower swim is kind of legendary and will never be trumped (scroll to the bottom of that link for a quick view). The swim for Golden Bear was fine but slow for me and I’m not sure why. The lake is so small you had to swim the perimeter, then get out, run down the beach about 25 yards and do it again for a total of 1,000 meters. I would tell you exactly how long it took but they removed the clock before I finished!! One of a few penalties for being slow. I didn’t let it get me down, though and it was off to the bike. You have that nasty, sharp up on Lynch Rd coming out of T1 but then it’s some up and some down and all in all it’s a pretty nice ride. See you have that not so huge up coming out of T1 although it was more of a thigh burner than you might expect. Then you get some serious down that was way fun. It is steep and curvy to the point where they had monitors on the course telling you to slow down. Then you get some no big deal rolling stuff and then… just when you are getting tired you get some uuuuuppppp and some more up and then some down followed by some more up until you want to rip your legs off and toss them over the barbed wire fence into the cow pasture. And then it’s one more sharp, nasty up, teeny down and then UP again and you are thinking “I thought it was the THREE BEARS!! Where the eff did this last bear come from???” . Brutal. Then, when you finally get to start screaming downhill they flag you down and tell you turn right into T2. Bastards! The biggest problem is just when you’ve had enough you have to run down Lynch Hill and try not to have your legs tie themselves into knots. And then you’re done! Okay – I might have walked that last hill and then burst through the trees running like I had run the whole thing – maybe. The bike at Golden Bear was only 22.76 miles compared to a full 25 at Wildflower and the swim was short but the runs were the same. Times: Wildflower – 4:39 Golden Bear 3:28 which included about 2 – 3 minutes of going the wrong way and having my bag go to the wrong guy in T2. Not a bad improvement, eh? My race club, FMRC had a small but powerful showing. Our relay team took first and the women took 2nd in 35-39, 1st in 40-44, and 1st in 50-54* and the men took 2nd in 45-49 and I think that covers everyone who raced. We rule! Trifreak did a great job with this inaugural race and are even going to return the bike shoes I left in T2 to my local running store, Forward Motion. I recommend their races to anyone. * that was first out of 2 but be that as it may – I beat her and a win is a win! Wow what an improvement! Good for you as the course sounds very hard, you are going to have a great racing season. Great job! whew girl – makes me tired just reading about it! Sounds like a really fun race – congrats on the bling, sistah! Great race report, and CONGRATULATIONS on your win! I also did that race (3:06, humbled to be last in my AG), and had the same crazy thoughts about those dang hills. I nearly snorted my tea when I read, “until you want to rip your legs off and toss them over the barbed wire fence.” Ha! I had a deer cross the road, pause daintily at the double yellow while I passed (tapping its hoof at the delay, no doubt), and then it crossed to the other side behind me. fist is first even if there is only one! Yay for you! Damn straight a win is a win! 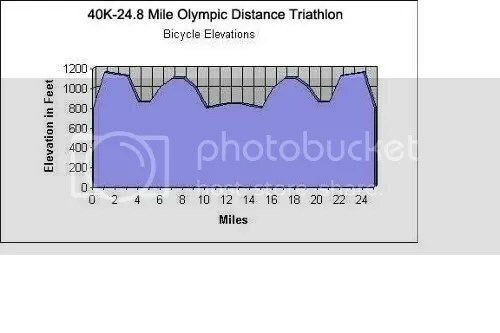 I will only ever do flat triathlons. just for the record. you really rocked that course. sounds like a really good day — hard but satisfying! and what an improvement! that’s GREAT, pamela! almost a whole hour better and first place? good job, girlfriend! 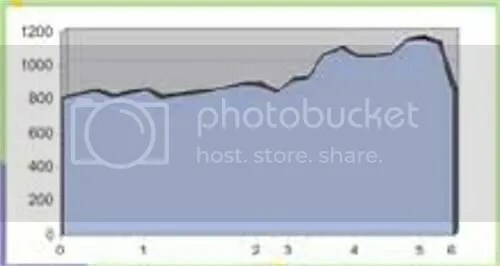 I love elevation graphs and maps! FABULOUS!! Great job on your first tri of the season! !